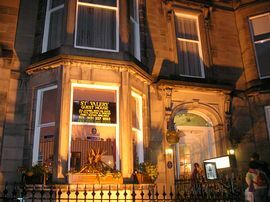 The St. Valery Guest House is a New Town building situated in the heart of Edinburgh's West End. 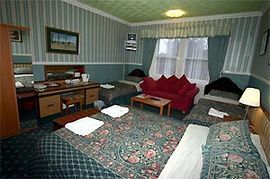 and is a family run guest house recently refurbished to a high standard, but still retaining the charm, friendliness and personal touch of a small hotel. 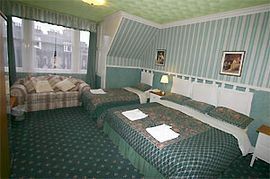 It is within walking distance of Princes Street, Edinburgh Castle and all the main shopping and sight-seeing areas, including the Royal Mile. Each of our eleven luxury bedrooms is centrally heated and has en-suite facilities with power shower,FREE cable TV ,DVD with cd player Direct Dial Telephone with Modem Access And FREE BROADBAND with your own laptop tea/coffee making facilities and hairdryer. Some rooms Have Kingsize beds available and some rooms also enjoy a lovely garden view. Trouser press and ironing equipment are also available on request. Haymarket Station: A two minute walk; come out of the station and turn left. 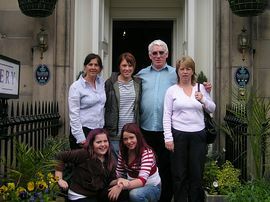 Walk past the Caledonian Ale House, Coates Gardens is the next street on your right. Waverley Station: BUS: Take a No. 2, 12, 26, 31 or 69 from outside the Tourist Information Centre. Get off at the stop immediately after Haymarket Station (which will be on the left) and Coates Gardens is the street on the other side of the road. A five minute taxi ride that should cost around £5.00 from Waverley Station. The walk will take approximately 25 minutes west from Waverley Station along Princes Street, Shandwick Place, West Maitland Street and Haymarket Terrace. Coates Gardens is the second road on the right once you reach Haymarket Terrace. BY PLANE: Airbus: Two companies run an Airbus service: Guide Friday and LRT. Both leave from outside the terminal at approximately ten minute alternating intervals. Ask the driver for the stop opposite the Caledonian Ale House. Look out for the 'stately home' on the left hand side and push the bell once to stop the bus. Walk back in the direction from which the bus came and Coates Gardens is the first street on the right. Follow the signs to the city centre. You will drive through Corstorphine (shops on both sides of the road), pass Murrayfield Stadium on your right and then two car showrooms approximately two hundred yards apart. Continue on under the old railway bridge then watch out for the 'stately home' on your left. Coates Gardens is the second street on the left after this. N.B. if you pass Haymarket Station (on the right) you have gone too far. A1: To North Newcastle then the A696 through Otterburn which becomes the A68. Go through Jedburgh and Dalkeith and into Edinburgh city centre (at certain points the A68 and A7 are the same road). At the Balmoral Hotel turn left into Princes Street, continue into Shandwick Place and follow the signs to Glasgow around the one way system (veering left, then right and right again) and past Haymarket Station, which will be on your left. Coates Gardens is the second street on your right. A90: Cross the Forth Road Bridge and follow signs for Edinburgh city centre. (You are travelling on Queensferry Road). Look out for the Holiday Inn on your right and Sainsbury Superstore on your left. At these landmarks travel on to the first roundabout and turn right (signposted Scottish Gallery of Modern Art) onto Queensferry Terrace. Drive straight on at the traffic lights and continue past the Gallery on your right. Go down the hill following the road (Belford Road) to the left (pass the Hilton Hotel on your right) and then sharp right and up the hill. At the next traffic lights turn right into Glencairn/Eglinton Crescents. Take the left fork (Glencairn) and Coates Gardens is the first road on your left. 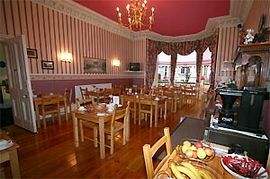 All of our rooms are en-suit and are accompanied by Meals with full Scottish breakfast each morning between 8am-9am weekdays and 8am-10am at weekends. If you would like book your stay with us, you can complete our online booking form to make your reservation enquiry.